I loved the 80's. There was so much fun and variety. You could find clothes in almost any color... not just neon. I see a lot of styles that we wore back then being sold in stores now. Not all of the clothes were wildly outrageous. My sister is twelve years younger than me. She wore some of my old clothes to high school for Retro 80's day. Some kid told her that she was not dressed properly. A lot of clothes don't fit the 80's stereotype. I hated the 90's clothes. They were so bland and lacked imagination. I remember a lot of denim and khaki and what I called the "desert colors". The colors weren't very flattering for me. Granted I was born in 1980s (hence I do not know how it was), I LOVE 80s fashion. So colorful! I came across this on youtube! I love their fashion! Their clothes, their hair etc! So retro! I know them, the Jets I mean. Close family friends. Read the first page of posts. I saw that but NEVER heard of them called wind suits. I guess it depended on where you were. I grew up near Seattle, AKA ground zero for the alternative rock scene. I think 90% of the "cool kids" who were white teenagers were trying to dress like Nirvana, 8% were goths and the rest just got picked on. Oh I'm sure it was different for teenagers, I just mean adults and children in the 90s wore mostly the same things they wore in the 80s, turtle necks and ugly sweaters and stuff like that. Probably has to do with the feminist revival since 2012. This was my recollection, too, that candy-colored hair began in the 90's, but I couldn't quite recall. I'm not seeing anything on the fashion scene today that wasn't around decades ago. I have older relatives who used to wear skinny jeans back in the 1950's! They'd take their regular jeans to be altered. Nowadays with spandex added to the fabric, they're as skinny as you can get them, but that, also, is nothing new. Leggings and jeans/leggings hybrids have been around since the early 90's, at least. I had stirrup pants in the 80s which were a lot like leggings. Anyone remember those hideous overalls that looked like clown suits in the early 80's. They may have peaked earlier elsewhere. My state was years behind the fashion. Anyone carry a comb or pick in your back pocket? Lol! I think those examples in the video were the most extreme cases. I don't remember any normal people actually wearing leg warmers and head bands. 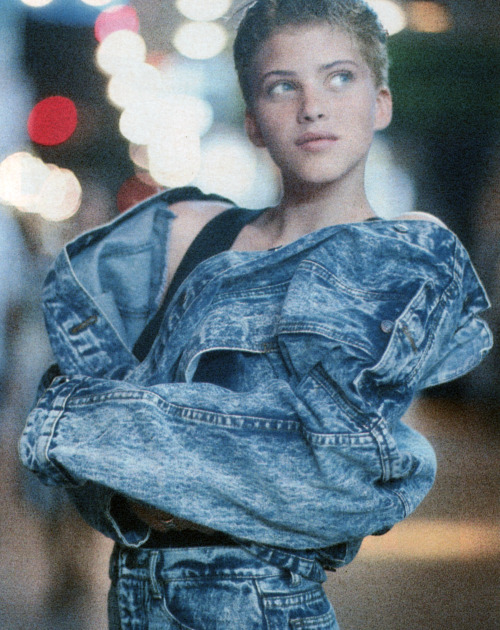 I do remember lots of acid washed denim, including jackets. Lots of Jordache brand clothing. And of course, the girls usually had big "teased" hair. Reebok sneakers were much more popular back then for guys. I had legwarmers. So did most girls in my second grade class at the time. This was 1984-1985. I recall my casual attire from those days with much as today...denim jeans(casual dating dress as in cotton/canvas trousers), casual sports shoes or casual dress ones as in dockers + a t-shirt or pullover (polo or la coste) much as today. I did wear a bomber jacker ala Indiana Jones(still own and use it) and a Member's Only Jacket( sadly no longer with us)- Like the one currently worn by Jon Voight in Ray Donovan. There was some questionable fashion but I was never part of that. Ah, well the short shorts for men as worn by pro-tennis players then. Incredibly comfortable and far superior to the over-sized knee length stuff today. A big plus if one has handsome legs for a man as I do. Too many fat young people out there today and so they cover up their fattiness with sizes too large and long lengths on shorts. Did not see many fatties of my age back in the '80s in my travels. Now hair is another issue. I had a full beard for most of my early-mid 20s and note they are popular now among that age group in those who can grow a decent beard. Van Damme made the mullet fashionable and Steven Segal the pony tail for men. I did not have mojo to wear one. I was Never a rebel. As for women, well you know women tend to be frivolous and move from fashion to fashion. I think it is an excuse just to buy stuff over and over. Last edited by Felix C; 01-10-2015 at 10:15 AM..